Posted on October 16, 2016 at 9:56 pm. The Star Entertainment Group has unveiled three shortlisted designs for the $500m hotel tower set to be built in the Sydney suburb of Pyrmont. The Star hotel tower, which is set to open in 2021, will operate as the Sydney Ritz-Carlton. It’s expected to soar high above the city skyline, offering full panoramic views over Sydney Harbour. The six-star hotel will offer 220 hotel rooms and about 150 upscale residential apartments, as well as premium function spaces, conference facilities and a grand ballroom. When completed, the development will bring The Star’s room inventory to over 1,000, while adding a further 20 food and beverage venues to the casino’s offering. The three shortlisted designs are by BVN, Grimshaw and Francis-Jones Morehen Thorp (FJMT), with each design showing extraordinary talent and vision. The final design will be subject to feedback from the community and various stakeholders, with the final decision going to a five-person panel made up of Peter Poulet (NSW Government Architect and executive director of the Government Architect’s Office), Craig Allchin (professor of architecture at the University of Technology Sydney and director of Six Degrees Urban), Lisa-Maree Carrigan (director of Group GSA), James Doolan (regional vice-president of hotel development, Asia Pacific for Marriott International), and Greg Hawkins (managing director of The Star Sydney). The Ritz-Carlton hotel project is Star’s attempt at keeping up with the competition set by the Packer owner Crown Group, who have approval for a new six-star casino and hotel complex on the other side of Darling Harbour. 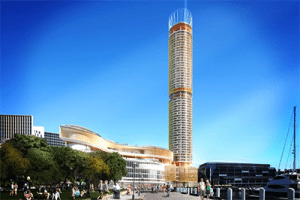 The Crown Resorts towers are being developed in Barangaroo South, with a major focus on VIP guests and international high rollers.